How many Bitcoin exchange websites you know that is based in the United States? There are only a handful of websites that operate as BTC exchanges that are based in the states due to regulatory problems and legal issues that most companies decide not to undergo with. Let us lessen the circumference a little more! How many BTC exchanges are there in the United States that are being regulated by the New York State Department of Financial Services or NYSDFS? Today we will be looking into Gemini.com. A US-based cryptocurrency exchange based in New York City! We will be exploring their website, know more about their features, create an account, and even get a preview of their trading platform if we can. Without further delay, let’s talk about that! Registered as Gemini Trust Company, LLC and is regulated by NYSDFS (not under BitLicense) the website has been providing exchange services since 2015. According to a CNBC report, Gemini became the world’s first license Ether exchange in 2016. What’s even interesting is that the company is owned by the Winklevoss twins. If you do not know who they are, they’re Beijing Olympiads, Ivy League graduates and sued Mark Zuckerberg for $65 million US Dollars. In 2013, they announced that they owned more than $11 million US Dollars worth of Bitcoin! And with the current price skyrocketing, you can just imagine how much those coins are today. 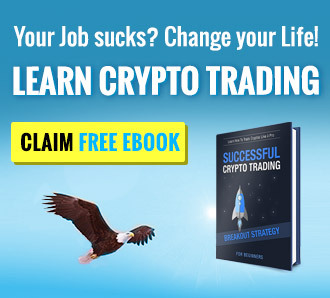 Clearly, the company is being managed by people that believe in cryptocurrency and how it can multiply its value in years. Now that we’ve touched a little bit of the company, let’s try to create an account with them. Head on to the website of Gemini.com and click on the “Register” button found on the upper right-hand side of the homepage. 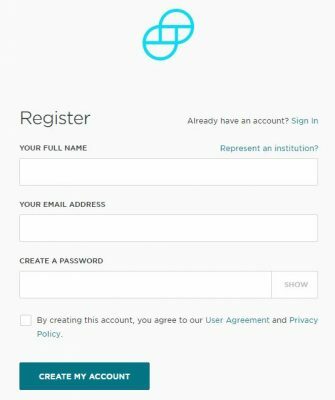 To create an account, you need to provide your name, active email address and the password for your soon to be account; easy right? Well, that’s just the first part. After receiving the confirmation code, you will need to enter this on their website and be redirected to the verification process. There are four stages that you need to go through in order to have the account verified. First is the Two-Factor Authentication wherein users need to provide an active phone number. Second would be the Bank Account, bank accounts need to be within the countries they operate in. Third would be the ID verification wherein aspiring users need to submit photos of their proof of identity. Last but not the least is the supporting documents for your identity. If your country is not part of their operation yet, you can try creating an account with their sandbox trading platform. All you need to have is an active phone number and you’re good to go! We did go for this option since our country of origin is not part of their current operation. Worth mentioning would be their “Sandbox” website which acts as a practice account for people that are interested in knowing more about the website. You can create a sandbox account here with just an active phone number for 2FA. Yes, even their sandbox version has a 2FA feature activated. Now that we’ve created an account with their sandbox trading platform, let’s try and play with it a little. Please be advised that their live account is exactly the same as this sandbox version, the only difference is that you have play money in their test version. On the upper left-hand side of the trading platform, we’ve got the BUY and SELL tabs. The screenshot preview shows the “BUY” tab wherein the trader is positioned to place some buy orders. The sample shows the currency pair of BTC/USD. 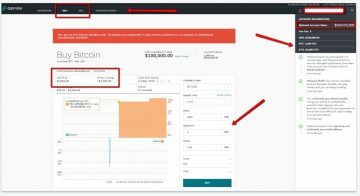 Select the order type, the price per BTC, the quantity of BTC the order needs, and the total USD will be calculated below. The right-hand side panel shows the current value of the account that you have with Gemini.com. Under the account value, we’ve got the balance for USD, BTC, and ETH. Overall, their sandbox platform was great since we were able to click some numbers in and experience what they have for their verified customers. Fees! Even if we haven’t had the chance to play around with the real trading platform, we’ve looked around the website and read more about their services instead. We found out that their taker fee starts at 0.25% for taker/maker. This would really depend on how much trading is going to happen. You can read more about the whole fee schedule here. Now what’s really awesome is that they do not charge anything for all deposits and withdrawals that are happening on the website. This means that their deposits and withdrawals are FREE of charge. Though they made it clear that they do not shoulder bank charges but they do not charge any transactions going in and out of the website. This is great, given the fact that they charge really high maker/taker fees! Read more about it here. Because of our experience in exchange website reviews, we found out that most problems come from their customer service. There are a number of websites that get bad reviews because their customer service team did not provide appropriate resolutions for their issues. Most of these complaints we’ve seen come from websites that only have email support to back their websites up. The problem with email support is that representatives would take days to dig through their queue and resolve issues. By the time they get to your issue, it’s now resolved or you do not care to get back to them anymore, which leads to losing customers. Here at Gemini.com, they have a Zendesk email system that everyone can access. Do they respond fast? We have no idea. If you guys have sent them an email through this system, please do let us know in the comment section below. Though we might not have tried their actual trading platform, the review was great. We get to try their sandbox website and got a preview of how things are being played out. Their website is intuitive and easy to use. Their fees might not be great, but this can improve over time. All-in-all, a great website backed up by twins that think BTC is the next big thing after Facebook! Gemini is Garbage!!!! I used Gemini for a few years and they consistently ask me to prove where I got my bitcoins from. I have 150 Bitcoin miners that I bought in 2011-2012 and I only cash out my bitcoins. I never send my bitcoins to other people or use them to buy anything. Gemini closed my account today with no reason given. They did this despite I don’t buy bitcoin or sell them. I don’t do anything but mine and cash out my bitcoins. LOL, I am 100% the perfect customer with no illegal bitcoin activity. lol, and they close my account lol HAHA how sad is this company becoming? I reported an unauthorized withdrawal from my checking account. After a few brief responses, including when I first reported it to them..”thanks for your note”!?? I have not heard a word!!! I e mailed them multipal times with no response!! Not a company that I would want to business with! !